The seventh and final part of Antonio Neri's 1612 book, L'Arte Vetraria, contains miscellaneous recipes, a number of which are devoted to making paints. Initially, this might seem an odd choice of subjects for the first printed book devoted to glassmaking. We think of fine artists of the seventeenth century working on fresh plaster, on wood panel covered in gesso, or on canvas – the medium that had recently become the new favorite for oil painting – but not on glass. On second thought, painters did labor over stained glass windows destined for churches, and any number of smaller glass objects were decorated with paint. 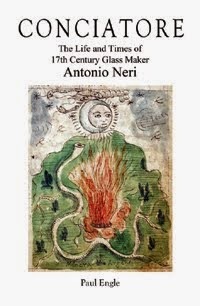 To be clear, glass "painting" could take two forms; the first, enameling, was done with pigments that could withstand furnace temperatures, a subject Neri covers in the sixth part of his book. 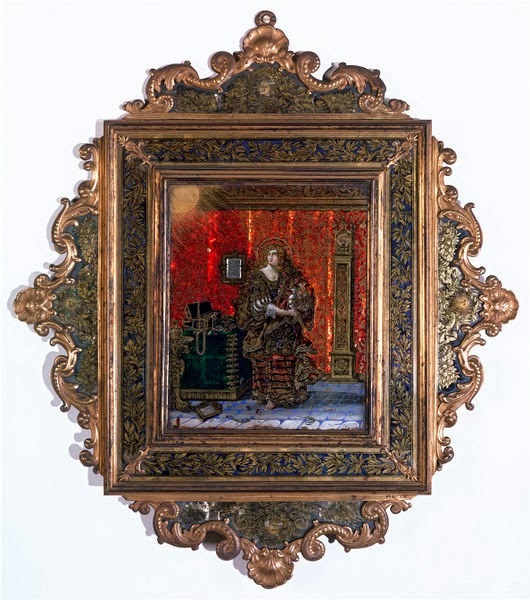 A finished glass object or pane was decorated and then fired a second time either in a furnace or over an oil lamp, Neri specifically mentions his "good friend, Mr. Niccolò Landi," as an expert in this technique. The second form of glass painting is our current focus. This involved traditional paint pigments, which were applied cold and not reheated. These were available in a wider range of colors, but are less permanent. This second technique was applied to vessels that contained holy water, delicate "cristallo" showpieces, perfume bottles and a range of ornamental trinkets. The enhancement of glass objects with brushwork was traditionally a female occupation. Glass factories employed teams of women and girls to decorate finished pieces. "Reverse" painting is a technique that dates to the middle ages, in which a picture is built up by applying paint to the back side of a piece of clear glass. In the hands of a talented artist, quite refined images were achieved with this method. In his book, Neri shows how to extract the color of common flowers to make a variety of pigments called "lakes." He shows two different methods. In the first, he uses the example of broom flowers to make a yellow pigment, the flower petals are gathered and steeped over a low fire in a solution of glassmaker's soda and lime. After a time the color transfers into the liquid. "You will know this [state] when you take the flowers out and see that they have turned white, and become thoroughly uncolored, and the lye is as yellow as a fine Trebbiano wine." The liquid is moved to glazed terracotta pots and boiled. Alum is added until no more will dissolve, which forces the pigment out of solution. [T]hen remove it, and empty the lye into a vessel of clear water. The yellow color will settle to the bottom. Leave it to rest, and then decant off all the water. Again, pour more fresh water over it, decant again and let it rest. As before, the dye will go to the bottom. This way, you will extract all the lye salts and the dose of alum out of the dye. Finally, the pigment is collected and dried, ready for use. In the second method, the flower petals are packed into an alembic and saturated with grappa – the strongly alcoholic distillation of white wine. As the alembic is heated the grappa extracts the color from the petals. These methods emphasize Neri's broad experience and the cross pollination that took place between the various arts. It is not clear if he learned these techniques in Florence, or in Antwerp (or Rome or Venice for that matter); none of these cities had a shortage of talented painters, and Neri must have crossed paths with them. Where there were painters, there was a demand for pigments and for the knowledge to produce them. Even as a twenty-two year old, freshly ordained Catholic priest, Neri exhibited the signs of his own instruction in drawing and watercolor. His earliest manuscript on alchemy is replete with color illustrations, perhaps the very colors he teaches how to make in the glass book.